The main argument for affirmative action is that institutions should reflect racial percentages of population, if not there must be de facto racial discrimination. Here is the breakdown of students by race at America’s premier university, Obama’s alma mater, Harvard. 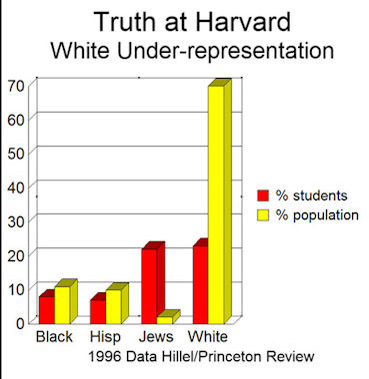 Even though non-Jewish White Americans are about 65 percent of the population and are 70 percent of the highest performing students, non-Jewish Whites are only about 20 percent of the Harvard student body. So what race is really the victim of racial discrimination? For those who are truly dedicated to stopping racial discrimination, what are you going to do about this massive discrimination, or does it not matter to you because White people happen to be the victims? The hidden, massive racial discrimination that goes on in America against White people! Commentary by Dr. David Duke — As most of you know, the term “white supremacist” has become literally a prefix of my name when I am in the news. It is the media’s way to condition readers not to pay attention to what I say because I am a “white supremacist.” The truth is I am not a White supremacist, and I seek no supremacy or control over any people, but I do demand that the rights and heritage of people of European descent be respected as much as any other people’s rights. I furthermore demand that our people, as all people, have a fundamental right to our very existence and identity. The fact is that in the United States of America, Canada, the UK and in many other areas of Europe Whites face a powerful state-sanctioned, and often mandated, racial discrimination against White people who are better-qualified than their non-White counterparts. It may be surprising to some reading this, but millions of discriminated against Whites are often poorer and face more difficult social situations than many of their non-White counterparts who are being given preference over them. It also affects the most talented of our people. Many Whites are under the mistaken impression that the White victims of racial discrimination are only from the low income and low IQ sectors of the population. Nothing could be further from the truth. In actuality, the percentages of Whites who are victims of racial discrimination are much higher against the sectors of the White population with the highest intelligence and greatest abilities. The facts are shocking, but true. Most people know that most universities have programs of admittance that give less-qualified minorities preference over better-qualified Whites. Almost all of the Fortune 500 largest corporations have affirmative action and diversity programs that discriminate against White people, both male and female, in hiring. They also have programs of racial discrimination that favor less-qualified non-Whites in promotions and advancement. This is true in academia as well. You can look at almost any academic department of any American university and you will see in place a strong racial bias for “minorities” in preference over Whites in hiring and advancement. Go to any sector of State Government, country or city government and you will find a wildly disproportionate percentage of blacks and other minorities in the well-paid, benefit rich jobs that are secure for a lifetime. A perfect example is Atlanta, Ga where about half of the working age population is white, but city and county government is overwhelmingly black. Whether you are talking about a university History, English or Math department in almost any university, these policies are in place and powerful. These racial discriminatory policies are real, and they can be easily proven to exist. But now, thanks to a government study, there is even a more powerful way to show their real impact on tens of millions of White Americans. The brilliant economist and author, whose pen name is Yggdrasil, has compiled the data from the National Longitudinal Survey of Youth (NLSY) (beginning 1979,and continuing) which was a massive study conducted for the U.S. Department of Labor, which contacted 155,000 families to obtain a representative sample by race, IQ, income, education and other factors, to see how remedial efforts for minorities were doing and if they faced racial discrimination. In fact it proved massive discrimination against White people in hiring, salaries and promotions. 12,686 survey participants were to be interviewed each year, of which 11,914 took the AQFT test – essentially an IQ test with a very high “g” loading. The income, education and net worth charts deal only with the group which completed the test and then were tracked over time. The charts use the AQFT89 percentile scores, considered by experts to be the most psychometrically accurate. It was done after the installation of so called “affirmative action” programs which gave preference to non-White groups over whites. The NLSY study is meant to follow this huge sampling for their entire lives to see how diversity is working out for America. The data from this ongoing study is tangible proof of the horrendous level of racial discrimination going on against White people. Here are some important elements of the study that prove the existence of massive racial discrimination going on against white people. Here is a chart showing the ethnic breakdown of the most prestigious university in the United States of America: Harvard. America’s premier university is extremely expensive (unless you receive special grants and scholarships) and a degree from it just about guarantees its graduates the best paid and prestigious jobs America has to offer. 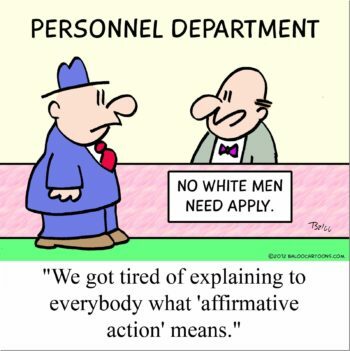 Affirmative action advocates have long said the companies or institutions that don’t reflect the actual racial population percentages are de facto racist and discriminatory. So what is the situation at Harvard, where non-Jewish Whites who are about 70 percent of the highest performing students in America but are now only about 20 percent of the Harvard student body. Also read The Myth of American Meritocracy by Ron Unz. One should first consider the fact that Whites are represented in the top two percentile level on college admission tests on an average that is a 5 times higher rate than non-White groups. If one then factors in the fact that Whites are also 70 percent of the population, there should be at least 25 times more Whites who would be better qualified than the non-White students currently at Harvard. 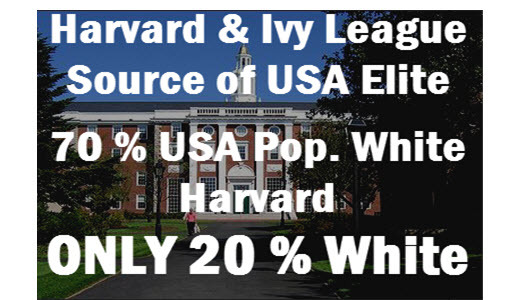 But even though these Whites are the best and brightest America has to offer, they are limited to only 20 percent of Harvard students! Such is nothing more than blatant, racial discrimination. Jews use Affirmative Action to Discriminate Against Whites at the Elite Universities and to favor of less qualified Jews! 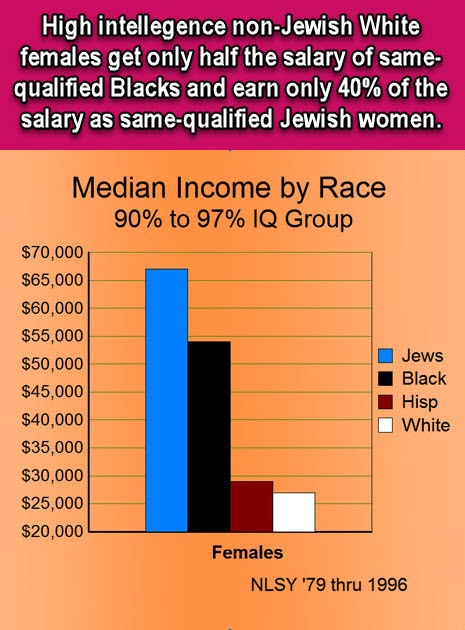 Another shocking fact one can gleam from this chart and many in the NLSY studies and the important work of Ron Unz who himself is a well-known Jewish writer and economist, is that Jewish over-representation is not at all based the fact that Jews have a high intelligence. They are 14 times overrepresented than their intelligence bracket would indicate. Such would suggest their intra-tribal racist tribalism that promotes their own and discriminates against their White competitors. Jews have gained control of the administrations of most of the Ivy League universities and use affirmative action (which lowers the importance of entrance examinations and academic records) to put less qualified Jews over better qualified Whites. The Jewish takeover and discrimination against Whites in the elite universities not only are horrifically unfair to the White victims, it has a huge impact in empowering a Jewish elite in America that dominates the critical areas of American politics, academia, media and finance. 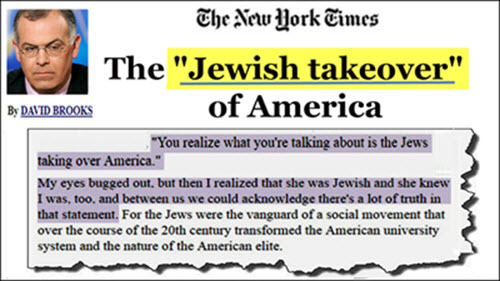 In talking about the academic takeover by Jews of American elite universities David Brooks of the NY Times literally calls it”Jewish Takeover of America” because the academic takeover translates to enormous power over the American establishment. The NLSY data also proves how incomes today in the USA correlate closely with race and intelligence even within racial groups themselves. Let’s take a look at the NLSY tracking studies of intelligent White women, these are White women in the 90 to 97 percent IQ bracket as compared to Black women in that same high 90 to 97 percent IQ bracket. When you examine Blacks who have intelligence in the highest performing group as Whites — The average Black females of that IQ level earned an average of approximately $54,000 per year through 1996, whereas White females on the same IQ level earned only half of that amount, about $28,000 per year through 1996. When White women in the same intelligence bracket of Black women earn half of the average amount that the Black women do, that’s real racial discrimination. I am not referring here to a select few White women who are at least equally qualified but getting half the salary that Black women do, I am talking about the average high intelligence White women in America! The NLSY is a big enough sample that reflects the whole nation. In fact it is meant to. The average White woman of high intelligence earns one-half of what Black women do of the same intelligence! White men of higher abilities also earn less than their black counterparts but the disparity is not as great. As incredibly discriminatory affirmative action is against White women in regard to Blacks, it is far, far worse in regard to Jews. According to the NSLY study, White women in the same higher ability brackets as Jewish women who are in those brackets — Earn only 40 percent of the income as the Jews do. In fact, Jews, who are as a group, the highest income group in the U.S. obtain their privilege through “affirmative action” which is supposed be aimed at helping up the disadvantaged. The Ivy League Schools and many other elite schools as exampled by Tulane in my home city of New Orleans, use “affirmative action” to bring in massive numbers of less qualified Jews and racially discriminate against better qualified European Americans. Even though the media has no allowed you to know it. In my entire political career I have advocated and supported true equal opportunity for the best person, regardless of race, to receive the college admission or job or promotion that they have earned through their abilities and hard work. We have no fear that our people will do very well on a fair playing field. Because we stand for true civil rights, human rights in this matter, we are called racists, and the real capper: “white supremacists” when the truth is that the establishment practices massive anti-white discrimination! There are many people in America and around the world who are ignorant of the facts of anti-White racial discrimination. The media act like it doesn’t exist. Even after the election of an affirmative action African-American President, America is still painted as an anti-Black racist country. The truth is that European Americans are facing racial discrimination in the very institutions and nation that our forefathers created. Our movement is truly a liberation movement like any other in the world, that strives for a people to be free and live in a society of our own values, rather than in an oppressive society imposed upon us. We are not racists or supremacists trying to deny the rights of others. We are human rights activists defending our people’s rights and heritage. The Jewish elite who “has taken over America” constitutes the ultimate racial supremacism in America, one that is against European Americans! Their control over the entertainment and mass media and over political fundraising has created a society where not a single person in Congress or the major media personalities can dare even condemn the massive racial discrimination against white people in America! Now you know how and why they paint me as the epitome of evil, because I dare to defend the human rights of all people, including our own, now that’ pretty terribile isn’t it? Here is the link for Yggdrasil’s great article complete with his powerful charts that show the racial discrimination going on against our people. Let this truth go out to America and to the world! And Here is the video I did a few years ago that is not suppressed by YouTube, no longer allowed to be embedded, that comes with a label warns of offensive content! Watch this video and see if you can find the offensive content — is it that this video exposes the massive racial discrimination going on against white people, and racial preference given to a special chosen minority that no one is allowed to name with facing vicious hatred and oppression.